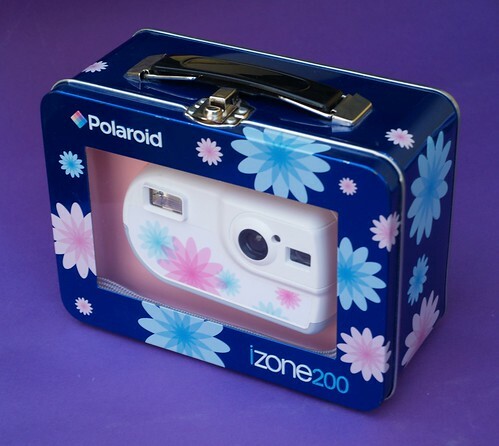 The Polaroid izone200 was a more compact camera type for the Polaroid I-Zone miniature instant film concept, but it needed thicker film packs than the I-Zone camera. The camera looks like a little soap box and was sold in a fancy puppet suitcase. Thus it seems that the target group for this camera were children. Like the I-Zone film the izone film is of a type that makes peeling apart layers from a film sheet superfluous. Thus children can't come in touch with the photo-chemicals. On the back the viewfinder camera has a selector for three modes: inside, sunshine and cloudy. A little lamp beside the viewfinder ocular indicates flash readiness. After exposure the selector on the back jumps back to the "OFF" position. The exposed film strip can be pulled out next (pulling it out triggers its development). In 3 minutes the image appears between the foil layers of the film. The upper layer is transparent so that the image becomes visible. The Camera was made in China for Polaroid. Fresh packs of the special film type are no longer available. Expired film delivers very poor image quality. But it's a toycam.